Verse 1: I am filled with love* for the Lord will hear the voice of my plea (Ps 114:1). Verse 2: For He has inclined His ear to me,* and I will call to Him all the days of my life (Ps 114:2). Verse 3: The pangs of death encircled me,* the trials of Hades befell me (Ps 114:3). Verse 4: I met with anguish and pain,* and called upon the name of the Lord (Ps 114:3-4). Verse 1: I believed and so I spoke,* but I was humbled exceedingly (Ps 115:1). Refrain: Son of God, who sat upon the foal,* save us who sing to You: Alleluia. Verse 2: What shall I render to the Lord* for all the things He has rendered to me? 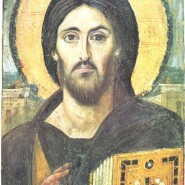 (Ps 115:3). Verse 3: I will take the chalice of salvation,* and I will call upon the name of the Lord (Ps 115:4). Verse 4: I will pay my vows to the Lord* in the presence of all His people (Ps 115:5). Verse 1 (Soloist): Give thanks to the Lord, for He is good, for His mercy endures forever (Ps 117:1). 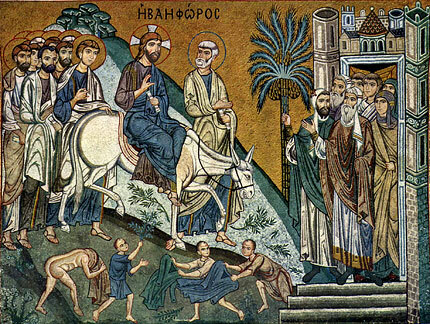 Troparion (Tone 1): Assuring us before Your Passion of the general resurrection,* You raised Lazarus from the dead, O Christ God:* and so, like the children, we also carry signs of victory* and cry to You, the conqueror of death:* Hosanna in the highest! * Blessed is He who comes* in the name of the Lord. Verse 2 (Soloist): Therefore, let the house of Israel say that He is good, for His mercy endures forever (Ps 117:2). Verse 3 (Soloist): Therefore, let the house of Aaron say that He is good, for His mercy endures forever (Ps 117:3). Verse 4 (Soloist): Let all who fear the Lord say that He is good, for His mercy endures forever (Ps 117:4). Entrance Verse (Soloist): Blessed is He Who comes in the name of the Lord, we bless you from the house of the Lord; the Lord is God and has appeared to us (Ps 117:26-27). Troparion (Tone 4): Buried with You through Baptism, O Christ our God,* we have been granted immortal life by Your resurrection,* and we sing Your praises, crying out:* Hosanna in the highest! * Blessed is He who comes in the name of the Lord. Kontakion (Tone 6): Mounted on the throne in heaven, O Christ God,* and on a colt here on earth,* You accepted the praise of the angels,* and the hymn of the children who cried to You:* Blessed are You, who have to call Adam back. Prokimenon (Tone 4): Blessed is He who comes in the name of the Lord;* God the Lord has appeared to us (Ps 117:26-27). verse: Give thanks to the Lord for He is good, for His mercy endures forever (Ps 117:1). Epistle (Phil 4:4-9): Brethren, rejoice in the Lord always; again I will say, Rejoice. Let your gentleness be known to everyone. The Lord is near. Do not worry about anything, but in everything by prayer and supplication with thanksgiving let your requests be made known to God. And the peace of God, which surpasses all understanding, will guard your hearts and your minds in Christ Jesus. Finally, beloved, whatever is true, whatever is honourable, whatever is just, whatever is pure, whatever is pleasing, whatever is commendable, if there is any excellence and if there is anything worthy of praise, think about these things. Keep on doing the things that you have learned and received and heard and seen in me, and the God of peace will be with you. verse: Sing to the Lord a new song, for He has worked wonders (Ps 97:1). verse: All the ends of the earth have seen the salvation of our God (Ps 97:1). Blessed is the one who comes in the name of the Lord—the King of Israel!’ Jesus found a young donkey and sat on it; as it is written: ‘Do not be afraid, daughter of Zion. Look, your king is coming, sitting on a donkey’s colt!’ His disciples did not understand these things at first; but when Jesus was glorified, then they remembered that these things had been written of him and had been done to him. So the crowd that had been with him when he called Lazarus out of the tomb and raised him from the dead continued to testify. It was also because they heard that he had performed this sign that the crowd went to meet him. Instead of “It is truly…”: O my soul, magnify Christ who is seated on a foal. 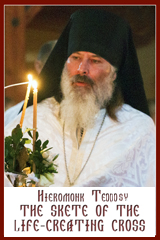 Irmos (Tone 4): The Lord is God and has appeared to us: together let us celebrate. Come with great rejoicing; let us magnify Christ with palms and olive branches, and with songs let us cry aloud to Him: Blessed is He who comes in the name of the Lord, our Saviour. Communion Verse: Blessed is He who comes in the name of the Lord;* God the Lord has appeared to us (Ps 117:26-27). Alleluia! (3x).